The shape of the head is determined first of all by the structure of the bones of the cranium. They can also indicate racial origins. 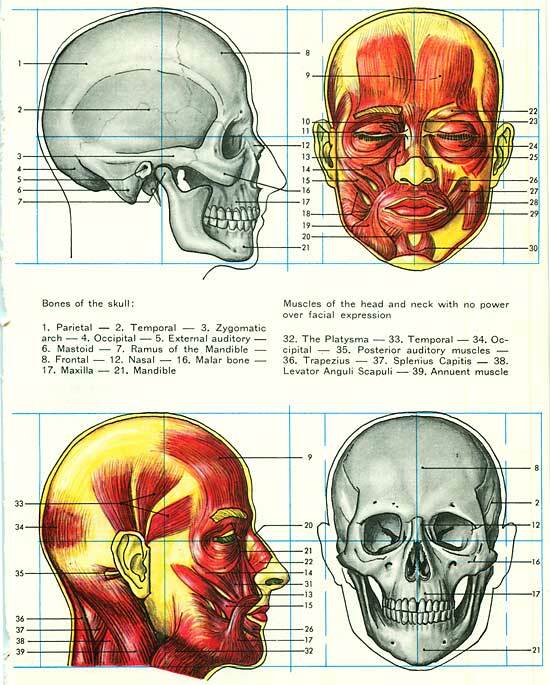 The average shape of the long skull is enclosed frontally in a rectangle. Its height is an eighth of the whole height of the body of a full-grown man. The breadth is two-sevenths smaller than the height. The same head in profile fits into a square with sides corresponding to the height of the frontal rectangle, one-eighth of the total height. The muscles of the head have primarily technical functions; they open and shut the mouth and eyelids; they move the lower jaw for chewing and biting. For blowing, sucking, and speaking the mouth muscles regulate the flow of air. The facial muscles, however, react to psychological stimuli as well, so much so that even small children and animals can understand clearly the momentary changes of mood of the person they are with from his face. Laughter, weeping, anger, and sorrow are universally understood expressions. 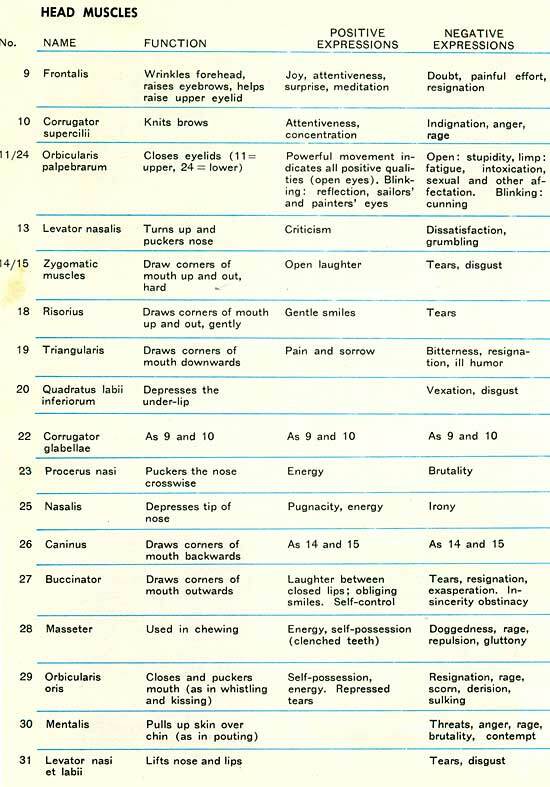 They are all facial movements caused by muscular activity. If certain stimuli are repeated frequently they become more and more impressed into the contours of the face, mainly by folds and lines in the skin. Constant cheerfulness or resentment, discontent, obstinacy, reserve or self-control create facial expression through the muscles of the face. A person's reaction to circumstances, rather than the circumstances themselves, determine the character of a face. Passing violent moods leave no trace. As can be seen in the diagrams, there are few facial muscles, but an infinite variety of effects results from their interplay, providing all the changes of expression - even as the thirteen notes of the well-tempered scale can combine in every possible way to form the whole range of musical expression. The laughing muscles, for instance, are also the principal ones used in crying, but the difference is established by the intervention of the chin-raising muscle and the muscle in the brow.